This tree has been growing nicely next to a condo entry, but was likely planted there when it was a much smaller specimen. Bob has exposed the topmost roots, and is working his way underneath the root mass. Note that he’s wearing ear protection and has dust barriers set up around the work area. 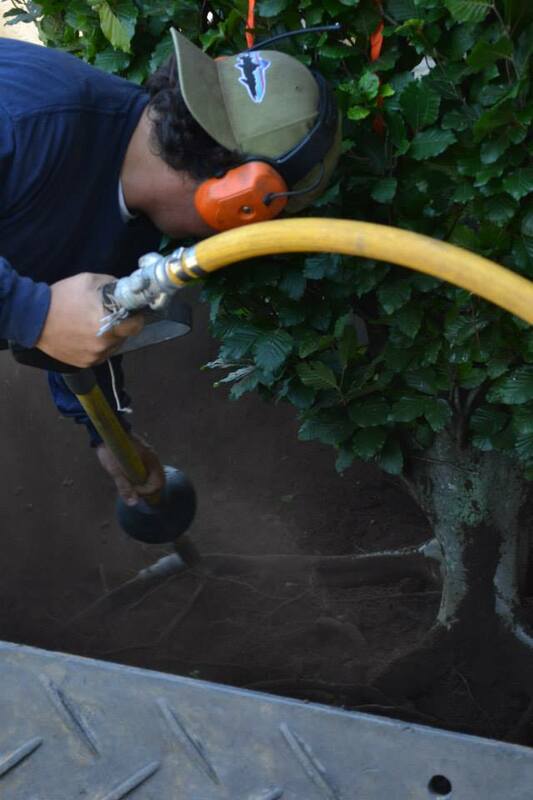 Fastigiate Beech is a narrow tree, and while a blowout to the dripline frees most of the roots, some root mass still had to be cut. Bob reports that his crew cut one root that was growing under the driveway. Nice root mass on this tree. 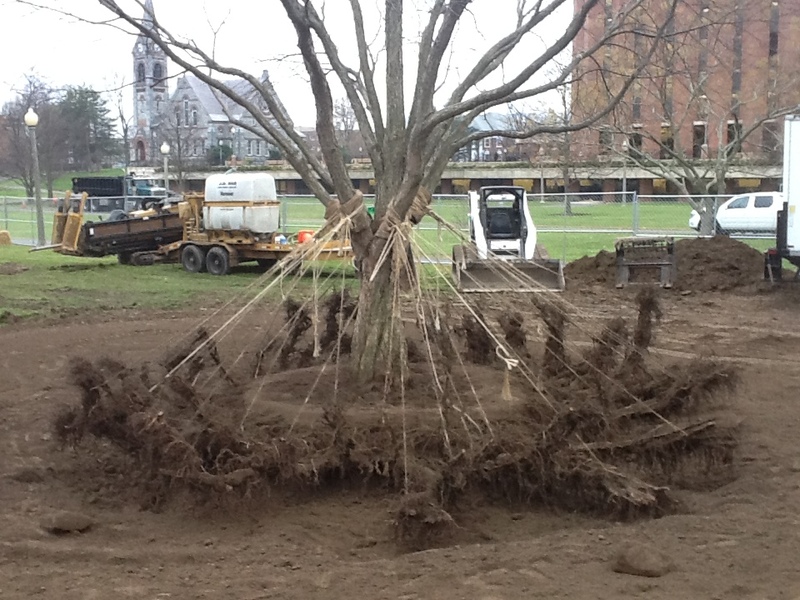 The time had arrived for this tree to be transplanted; notice that the roots to the right are shorter and have been redirected down by the presence of the building wall. A tree that grows for too long this close to a wall might not be as readily moved as this one — not because it can’t be dug out, but because the root mass has grown too asymmetrically for the tree to stand well away from the wall. 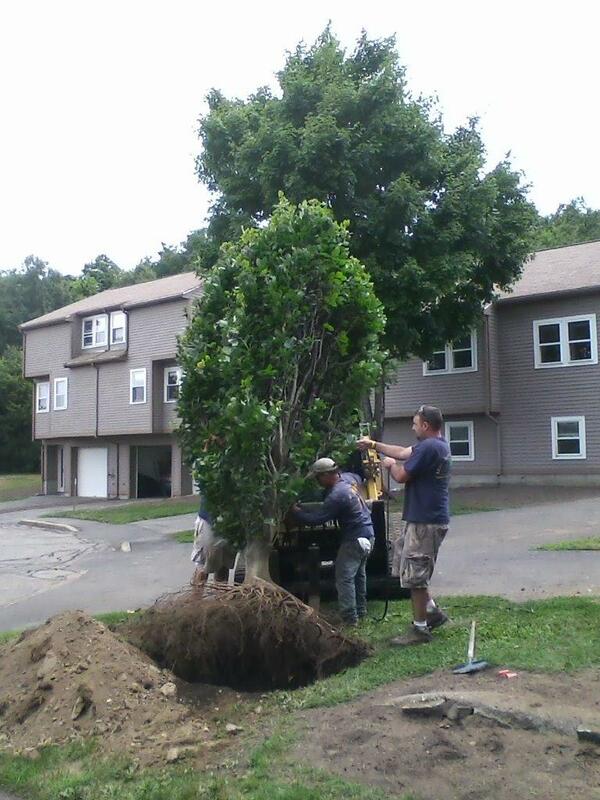 The Beech being introduced to its new home. 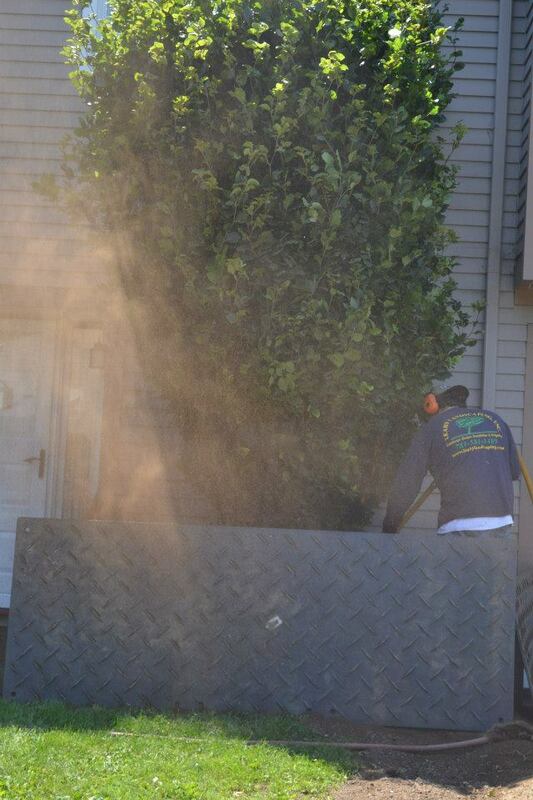 According to Bob, the crew could have lifted the tree by hand, but decided to use the machine to minimize hazards to it. 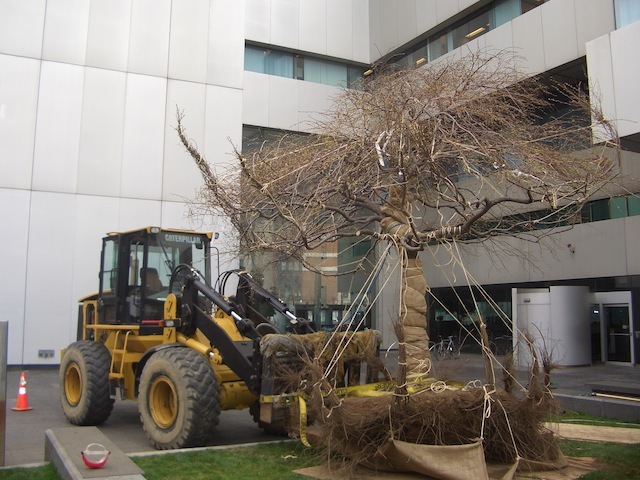 For the actual move, they tied the tree to the forks; this shot, it has been untied and is being guided into the planting hole. And from a different angle. The hole receiving it could be a bit wider, to make the backfilling and mudding in easier, especially as there are no obstructions around it. 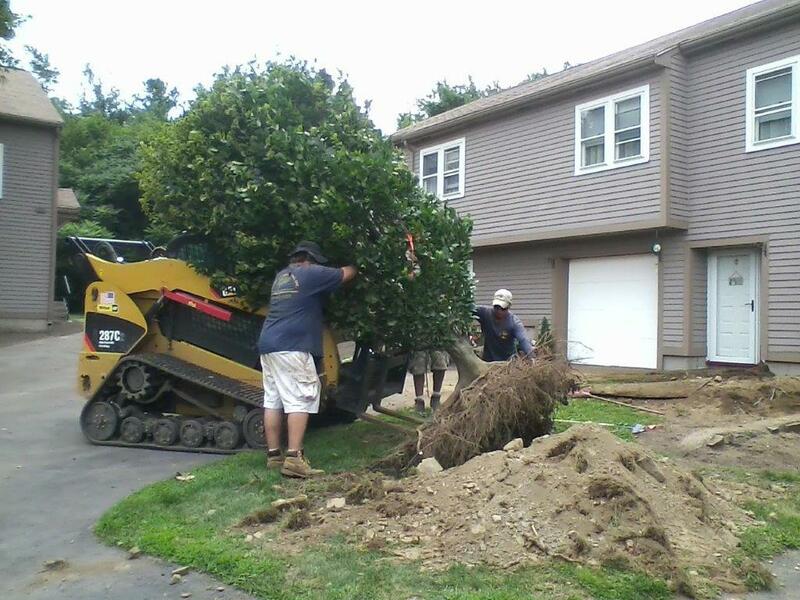 With the tree placed in its new home and backfilled, the crew waters and muds it in. 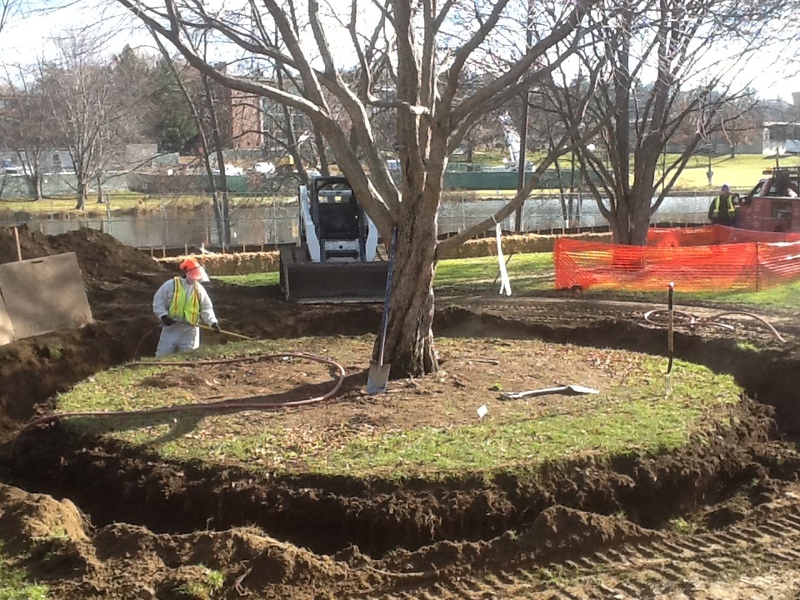 Leahy added better loam for backfill, and secured the tree with duckbills, to insure stability while it grows into the new location. 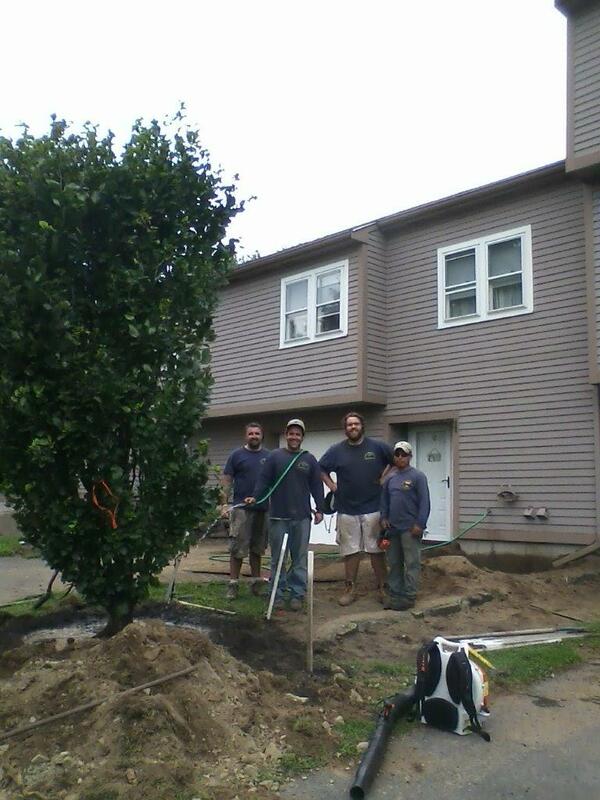 Proud Leahy crew and Fastigiate Beech. 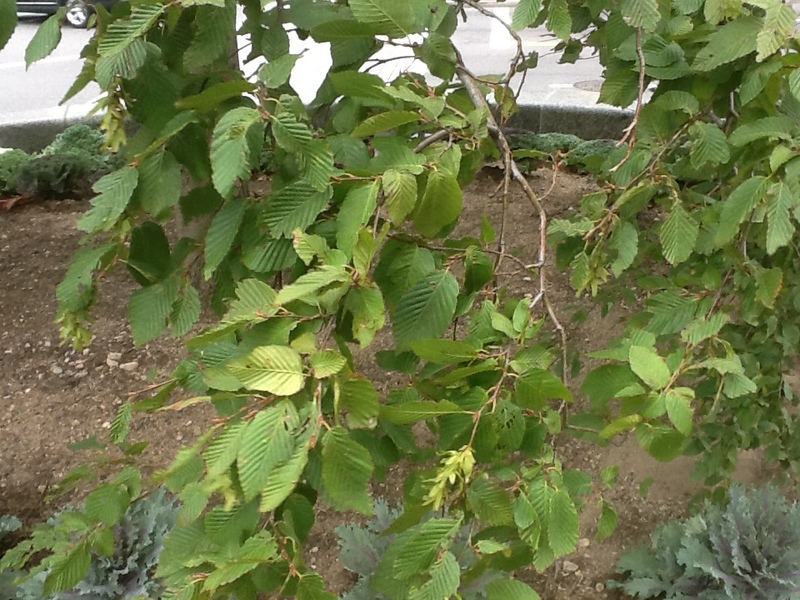 The Beech should now be able to grow a little fuller both above and below ground on the side that had faced the building. The transplant operation took about six hours from start to finish. Bob reports that the tree has experienced some stress from the move, but he expects it will equilibrate crown and root growth and leaf out well next year. We’ll keep an eye out for more pix next year, to check its progress. It was just over a year ago that an ecologist and ISA-Certified Arborist, Lisa Montana, contacted me from AECOM, the global architectural/engineering giant. 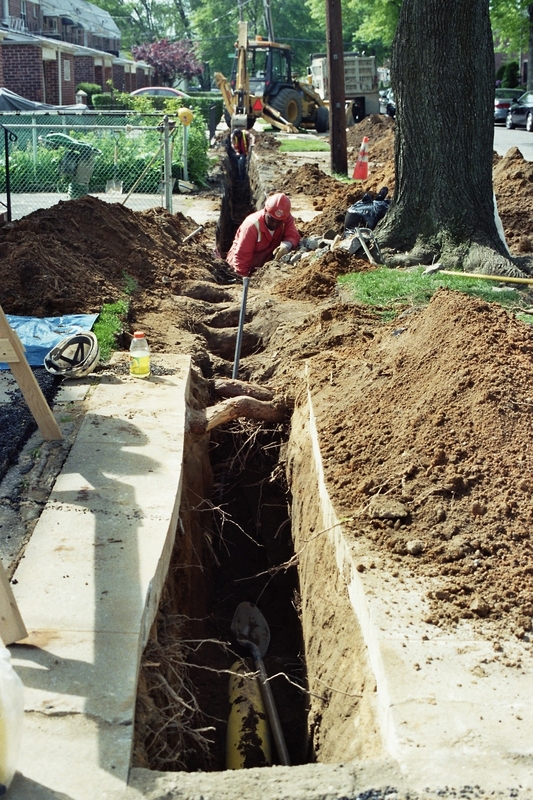 She works in New York City, and is involved on projects that require utility trenching under sidewalks and around the roots of adjacent street trees. When her project sites have contaminated soils, excavation must take place with shovels and bars, the old approach to bare-rooting plants. 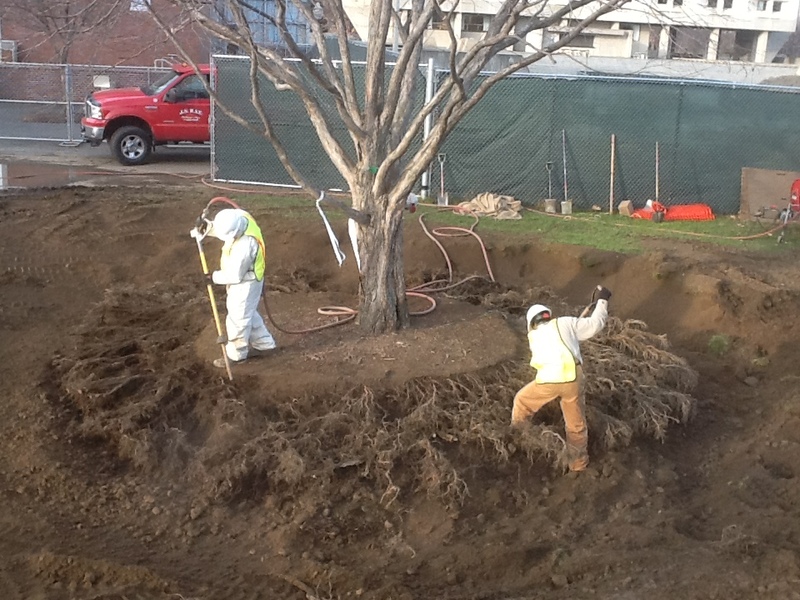 On sites with clean soils, the workers use air tools, which let them remove soil and preserve important tree roots. Lisa kindly sent me some photos of air-tool trenching projects she has overseen, and with my apologies to her for the long delay, I’m posting them here. 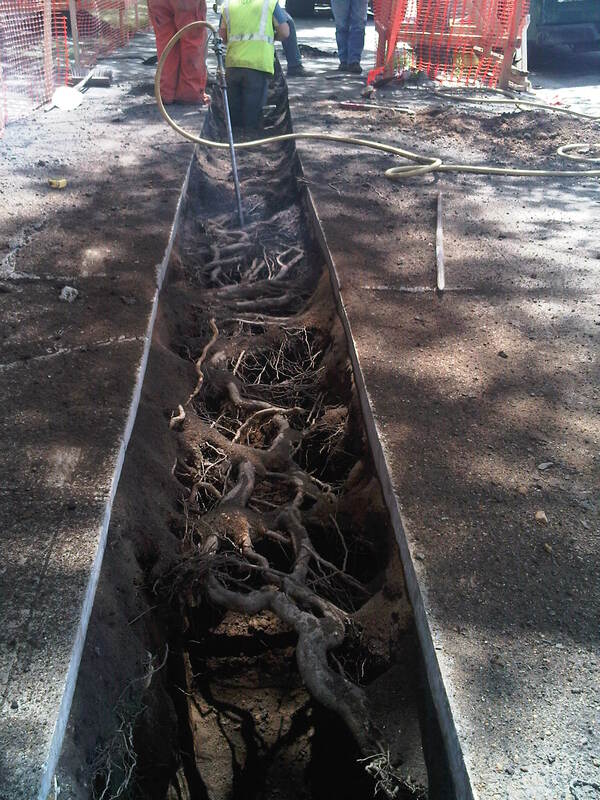 Take a look, and note how persistent and vigorous those critical roots are even underneath concrete pavement. 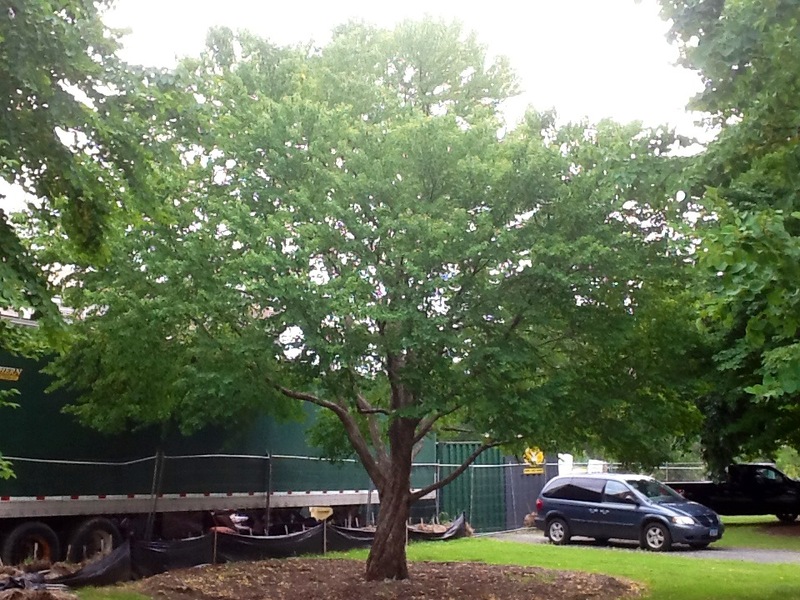 This one is a 26″ dbh Honey Locust. This astonishing root mass belongs to a 28″ dbh Oak. 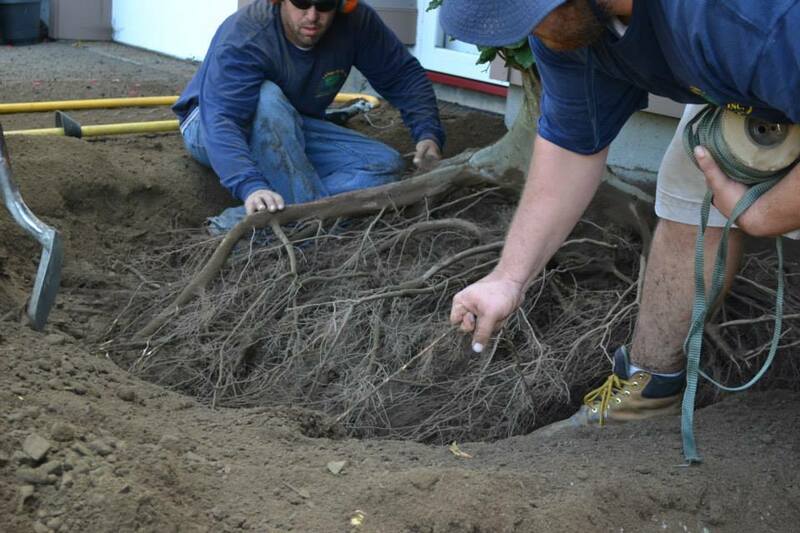 These roots come from an enthusiastic 29″ dbh Norway Maple that needs the rooting area in the lawn beyond the sidewalk. 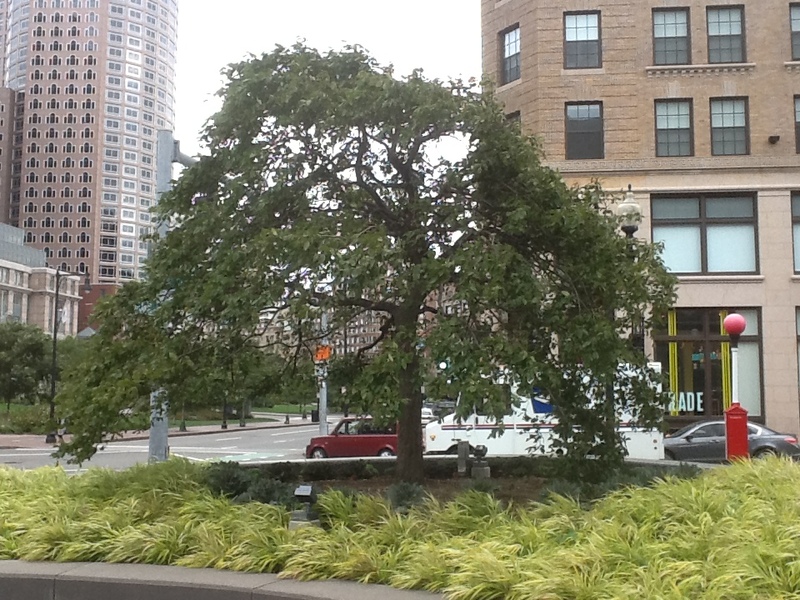 This final photo shows a 32″ dbh London Plane whose roots are seeking moisture in the bed beyond the fence. It appears as if each of these trees is reaching underground toward open ground, where adequate moisture and air can be found to sustain them. 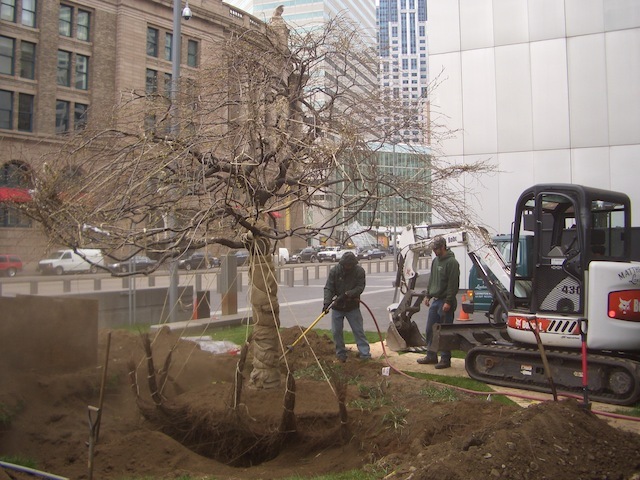 I have been mulling over these photos for some time, and especially since Hurricane Sandy, when so many uprooted New York street trees appeared to have root masses that conformed to the bar-like shape of their planting spaces. 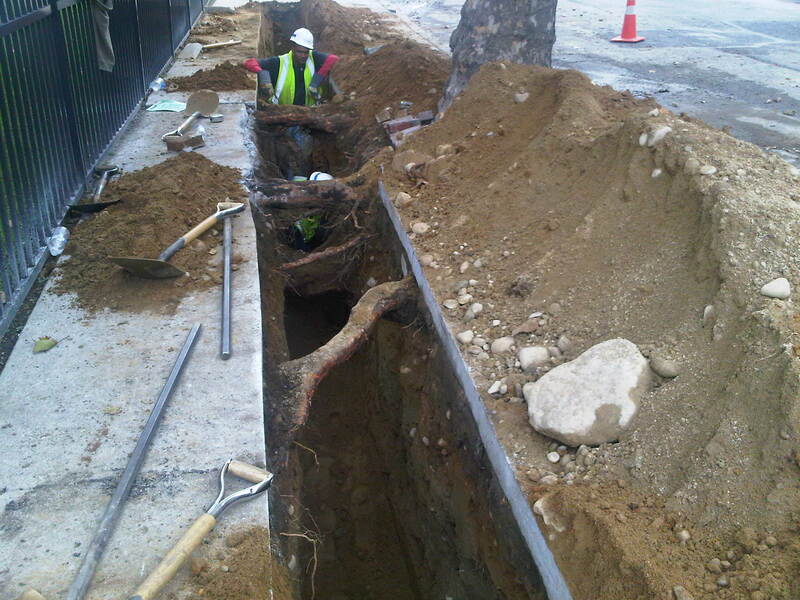 I wonder if those root masses had been cut at some point, as is often done for the reconstruction of a sidewalk or for utility work done in a less sensitive way than AECOMM’s methods. 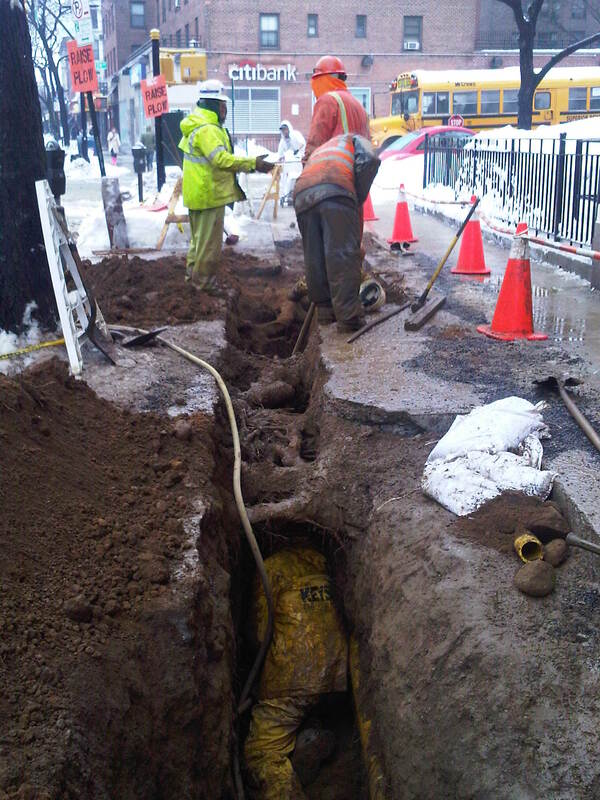 Thanks, Lisa, for sharing these photos, and giving us a peek at what’s going on under some sidewalks. 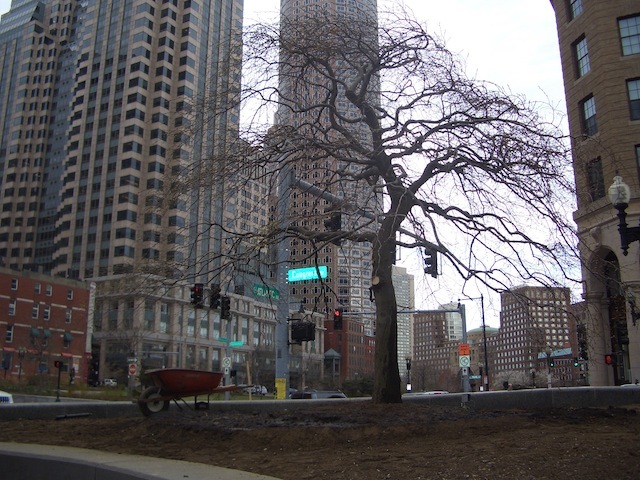 This 8.5″ caliper weeping hornbeam tree is getting transplanted from a bed on Summer Street, outside Boston's Federal Reserve Bank building. Note the pigtails on the tree’s near side, and the thick burlap wrapping to protect its trunk. 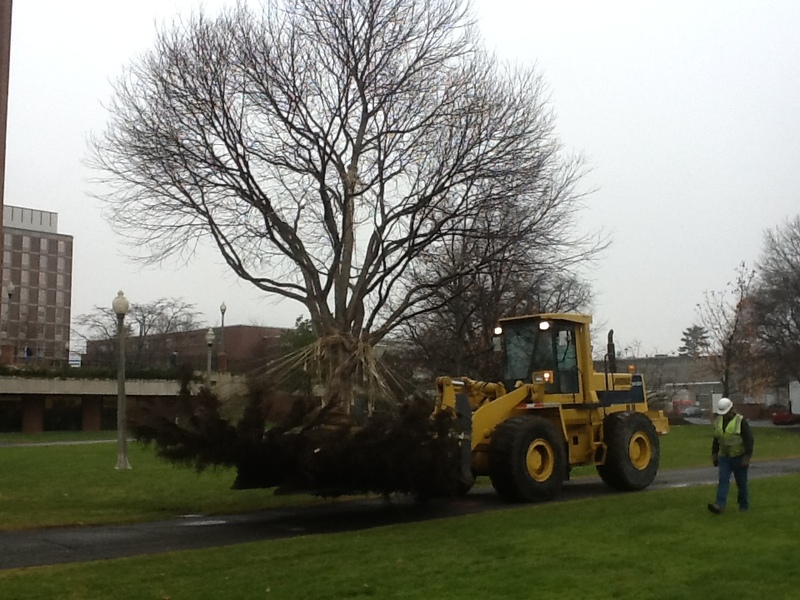 The tree being moved to its new home in a 3-4′ tall planter on the corner of Atlantic Avenue and Congress Street. 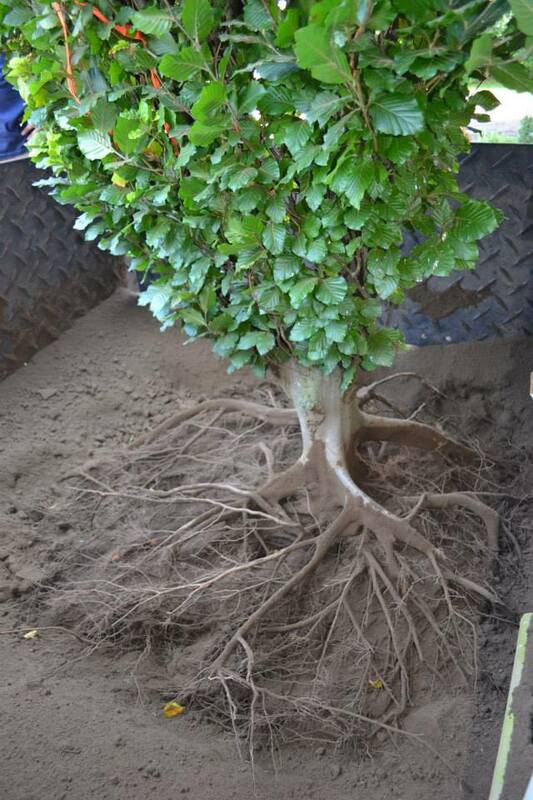 Burlap tied under the root mass helps contain loose soil during the move. 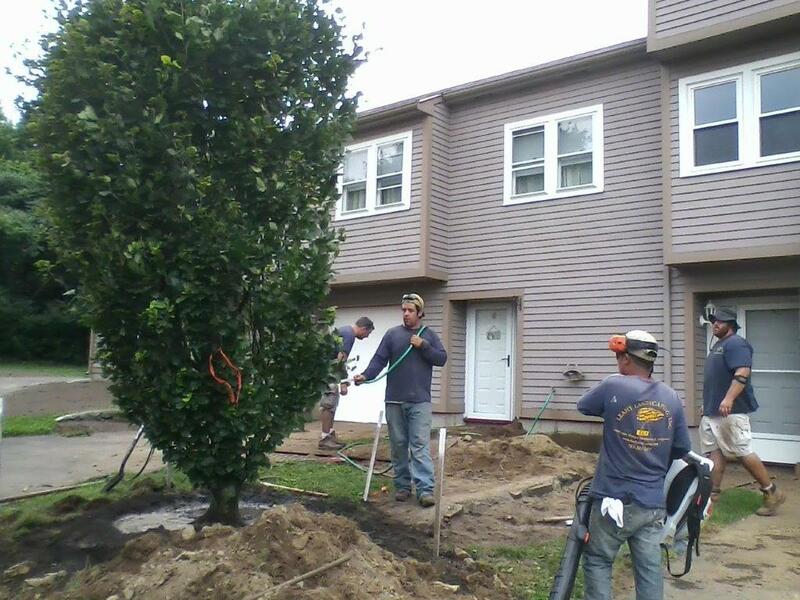 Weeping hornbeam in its new location. The Federal Reserve does an excellent job tending its plants, so this one should get the consistent aftercare all transplanted trees need. With this warm winter and spring, trees have been leafing out several weeks early; this one had just begun to leaf out before it got moved. 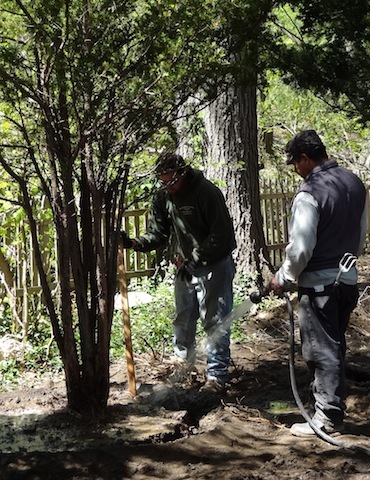 The Foti crew has had good success moving trees bare-root even during bud-break; it’ll be interesting to watch this tree and see how it settles in to its new home over the coming year.